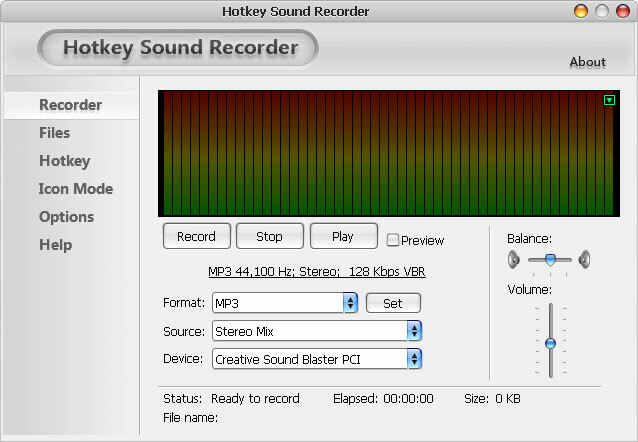 Hotkey Sound Recorder is a powerful sound recording software. Besides normal recording functions, it allows you to record sound by pressing hotkey or by clicking the system tray icon. It also allows you to use hotkey to turn sound up/down or turn sound on/off. With Hotkey Sound Recorder, what you hear is what you get! You can record streaming audio, line-in input, microphone input, sound of games or music played by Winamp, Windows Media Player, Quick Time, Real Player, etc. It is able to save recorded sound as MP3, WMA, OGG, WAV or VOX file. It supports MP3 ID3-tag and VBR. Hotkey Sound Recorder also provides built-in file manager to help you play, rename, delete recorded sound files and allows you to edit MP3 ID3 tag. It is also able to convert audio file between MP3, WMA, OGG, WAV and VOX formats. This site does not contain serial number, crack, keygen Hotkey Sound Recorder serial number : serial number is the simplest type of crack. A serial number(cdkey,product key,etc) is register the program as you may already know. a crack or keygen may contain harmful software. If you cannot find the exact version you want, just give it a try. for more information read .nfo/.txt/.diz file include in zipped file.